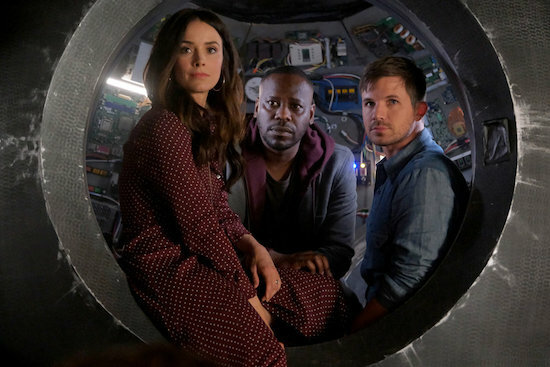 In the end, TIMELESS ended the only way it truly could. With Rufus’ (Malcolm Barrett) life on the line, the team realized they could only save him if they took out Wyatt’s (Matt Lanter) wife Jessica (Tonya Glanz). (It helped she had been faking her pregnancy.) Flynn (Goran Višnjić) took it upon himself to take one for the team, and traveled back to the night of Jessica’s death, and did the deed himself. But the decision was a sacrifice, as spending that much time in a period where he already existed was fatal; before he died, he went to see his family. Thanks to timeline change, Emma (Annie Wersching) was also without one of her only remaining allies, so The Time Team was also able to take her out. And there were a few happy endings in store as a now-alive Rufus and Jiya (Claudia Doumit) reunited, and Wyatt and Lucy (Abigail Spencer) finally became a full-fledged couple. The show flashed forward five years—to the same time period where Future!Wyatt and Future!Lucy from the second season finale came from, though with Rufus alive, things were very different: Rufus and Jiya formed Riya Industry; Wyatt continued to work with Agent Christopher (Sakina Jaffrey), and Lucy went back to teaching…and the duo had two daughters, Amy and Flynn. However, the Time Team had one last mission: to go find Flynn in 2014 so Lucy could set him on the path that started everything back in the very first episode. The story might not be over, though. At Connor’s (Paterson Joseph) suggestion, the team kept possession of the Lifeboat, just in case someone came up with the technology to make their own time machine. The final scene of the series found a young woman in 2023 doing exactly that. Starting with the end: At what point did you know that you’d be ending our characters’ journey with Lucy and Flynn at the bar and what made that the right way to close things out? There was a long process where we spent three or four weeks—we didn’t figure out the episodes [individually], we figured out the whole thing. It felt like for the first few weeks, we were a little bit in neutral, because we didn’t know what time periods we wanted to go to, we had some aspects we knew we wanted to do, but we didn’t know how exactly we were going to do them. The Brazil thing was something Eric Kripke, my co-creator on the show, really pushed for. I would say that it was a few weeks into the story-breaking process. Once we got into [that] we want Flynn to sacrifice himself, these are the internal character arcs we want, these are the time periods and stories in place, then the break happened quickly after that. But it was slow, it took a while. On the set of the NBC drama, stars Abigail Spencer, Matt Lanter, Malcolm Barrett, Claudia Doumit, Sakina Jaffrey, and Paterson Joseph preview the Christmas-themed finale. Due to the unusual nature of the wrap-up film, a number of actors had commitments to other projects. How did that impact the story you were able to tell? It didn’t impact it too much. We were told there would be some limitations with Goran. Our biggest limitations were with Paterson, who plays Connor Mason. He was doing something in South Africa, and was only made available to us for three or four days. So he was in the bunker and fairly limited. But that matches up with stories we usually tell. The fact that Flynn dies midway through the first episode and is only in the bar scene at the end—it was a very difficult, logistical scheduling. Not only did we have that, but Annie Wersching was eight-and-a-half months pregnant [during production]. We were trying to film her stuff early in case she gave birth. We also had a church [for the second episode] we liked that was only available for certain dates. There were lots of things. Jimmy Dodson, our line producer, did a really masterful job with our A.D. department to make it all work. But ultimately we told the story we wanted to tell. I think if we had scheduling issues with Abby or Matt or Malcolm, it would have been a lot more difficult. But fortunately for us, the three main Time Team players—and Claudia, who plays Jiya, who had a lot to do this episode—they were all free and clear for the duration of the filming for us. So, ultimately, it wasn’t too restrictive. There were a lot of things left dangling when season 2 ended. Some had a bit more play in the movie—Rufus’ death, taking down Emma—and others, like Jessica and the fake pregnancy reveal. How did that differ from the intended conclusion of those storylines? I think there are some storylines that would have played out in a much longer way if we had ten or 13 episode season 3. Jessica and her pregnancy…deciding Jessica was faking her pregnancy—I don’t know we would have done that in the same way with a season 3 story. But there was only so much time. We had speculated maybe Jessica was faking her pregnancy—it’s not something we made up for the first time [when breaking this]—but declaring it in the first five minutes of the show cleared it out of the way. It’s like triage. We had all of these things [unresolved] and it was admitting we can’t deal with all of these things in full. So which ones do we ignore, which ones do we deal with quickly and brush them out of the way, like the pregnancy, and which ones do we embrace as the heart of the finale is going to be? It was deciding here are the threads and which are the most important ones, and committing to that. What conversations did the writers have about Lucy ultimately not trying to save Amy? I would say there was some debate in season 2 of the writers’ room about that. I was always intrigued by the idea that Lucy would never get her back. And that was probably colored by my own personal experience: my father passed away a few years ago. Living in the shadow of that loss, having to come to a place in my life where you accept it, you miss him, but you funnel your energy into your kids and things that are forward. There is something very human and relatable about the idea that she suffered a loss that she can’t ever correct. Because that’s what happens to most people. You lose a parent or a sibling or a parent or a spouse or someone and it feels like the worst thing in the world. And you find a way to put one foot in front of the other. And then you get through a week, you get through a month, and then you get to a time where it’s not dominating your every thought. And you’re moving forward in your life. And seeing Lucy go through that emotional journey was ultimately more relatable, human, and satisfying than some quickie change of history and now my sister is back [move]. There was a fun moment when Agent Christopher, who was the only member of the team to not travel in time, got to go back and basically saved the day. Where did that come from? God bless Sakina, who plays Agent Christopher: it’s not always an easy thing playing the person left back at the bunker while the Time Team is doing their stuff. And the idea that she could make some moves in the present and get Emma to come back in the mothership and save our heroes when everything looks bad, I think it was a great moment for her character. She really does become the Saint Christopher of that story. It’s a character who didn’t get to have all of the great hero moments because of the nature of her never going back in time. It was something that Arika [Lisanne Mittman] and Lauren [Greer], our two writers, suggested that I really loved. We wanted to make sure it was two hours where every one of our main characters had a good moment somewhere. And that’s Christopher’s. I think it’s well-earned and well-played by Sakina. The show's fate remains up in the air. The series did have a relatively happy ending, with both Rufus/Jiya and Wyatt/Lucy ending up together. Why was that the right move for the show/these characters? And was there ever a happier ending for Flynn planned? This may sound strange, but I think Flynn has a happy ending! [Laughs] I think in death he becomes the person he really wanted to be. In life, in season 1, rage and revenge had led him to become the kind of person he didn’t really want to be. That’s the journey over these 28 episodes: he realized that. That’s the value of his conversation with Joaquin Murrieta, where he reveals to Joaquin—and to himself and the audience—that this quest is an empty one. So when Lucy tells him in a Brazilian bar that you’re maybe going to be the greatest hero of us all…to think he’s the villain in the pilot and in the final episode, he may be the greatest hero of them all, that is a happy ending, even though his life has ended. [As for the couples,] I think we’re an optimistic show. We’re more Time Team than Rittenhouse in that way. And we wanted something that felt optimistic. Because we are optimistic. We’re optimistic about the future and what people are capable. We want our show to be a force of good and an inspiration for that kind of behavior. But I do believe, if you live your life the right way, there are rewards here on Earth for that. It was important for me to tell that kind of story. The final scene of the episode teased another time machine is in the works…and the Time Team established they had the tools to get back into action should something like that happen. Certainly this show should never be counted out—especially after getting revived twice—but in your mind, if it were to come back, would it be an entirely new Time Team? Would it be Lucy, Wyatt, and Rufus in 2023? What do you see as the future of the franchise? The future is unknown. And when I say that, I mean that optimistically. I don’t think the show is ending [with the two-hour finale]. I think the NBC version of the show will be over. But we have an incredible fanbase; in this digital age, new fans can discover the show each day. We have an incredibly passionate fanbase that loves to make noise. It’s worked twice. I don’t know whether it would work a third time. And I don’t know what form a TIMELESS universe might take. Maybe it doesn’t take the form of a TV show or a movie. Maybe it’s in books or comic books or a radio show. I don’t know what it might be. But it does feel like there are more stories to tell in this universe with these characters. Obviously, the actors on the show are professional actors and they have to work to make a living, and they’re going to be looking to work on other projects. That brings in questions of availability and everything down the line. I don’t know if there will be another place that will want to spend the money to make a continuation. But I’ve seen examples in the past, whether it’s STAR TREK or VERONICA MARS or FIREFLY. I’ve seen these shows that ended and became something else down the line. 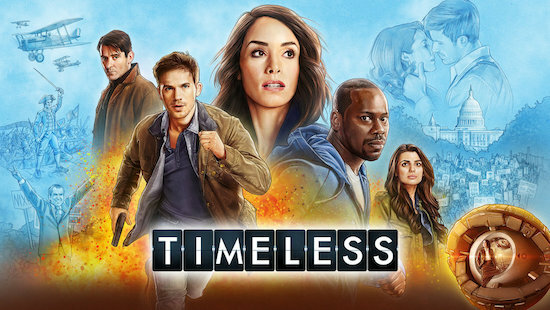 I think TIMELESS could be that kind of show. Will it? I don’t know what the future holds. But I’m also not prepared to plant the tombstone into the ground yet. 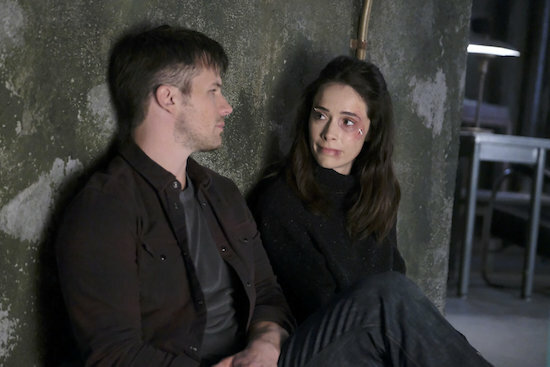 What did you think of the TIMELESS finale?